If you’re looking for a Halloween wine, this is it. Although Bogle is in fact the winemaking family’s surname, they obviously have a lot of fun with it. Phantom’s fact sheet declares, “bogle \bõ’gul\ n. [Scots, perhaps from Welsh] A goblin; a specter; a phantom; a bogy, boggart or bugbear,” and the Label Notes and Winemaker’s Notes (below) continue to express the theme. Dark red, the wine is rich in aromas of black fruit, spices, and cedar. It has a LOVELY aroma, and the taste matches up—but it is somehow more muted and shrouded in mystery than Bogle’s 2008 Petite Sirah, which we reviewed yesterday (http://www.thefrugalwinesnob.com/?p=580). And, despite its initial beautiful bouquet, it is softer than the Petite Sirah, and takes longer to open up than the Petite Sirah did. It is classy, earthy, even a little mushroomy. LABEL NOTES: In the dark recesses of the cellar you sense a presence, hear footsteps. Why is it these things only happen when you are alone? In the shadows, a glimpse of muddy boots and old blue jeans, the lurking legacies of hard work and determination left by those who have come before you. We are proud to carry on the traditions of our founders with this unique red wine: a deep ruby apparition that personifies the true spirit of the Bogle. 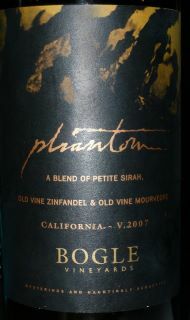 WINEMAKER’S NOTES: The coveted Phantom, Bogle’s apparition of three unique varietals, combines lush berry and fierce spice into a wine of complex character. Vivid essence of black pepper, dark fruit and juniper haunts the nose, while brighter flavors of blackberries and blueberries glance off the palate. From the shadows, toasty cinnamon and nutmeg emerge, subtly embracing the deeply luscious and succulent fruit to create a full-bodied, ruby rich wine. Captured in 1, 2 and 3 year old American oak barrels, this wine showcases the best these distinct varietals have to offer. Though the wine is remarkable now, age in the bottle will only integrate the three varietals more. Welcome the winery ghost into your home again with this latest vintage, and enjoy with full-flavored and hearty meals—before it vanishes again. This entry was posted in California, Mourvedre, Petite Sirah, Zinfandel. Bookmark the permalink.